No this is not for breakfast. While growing up, sunny side ups and boiled eggs were reserved for breakfast and the rest of the exciting eggs were all the main meal time affair. Often times when I am rushing or just plain lazy, I make myself (and sometimes for all of us) some quick scrambled eggs. This is one of them. 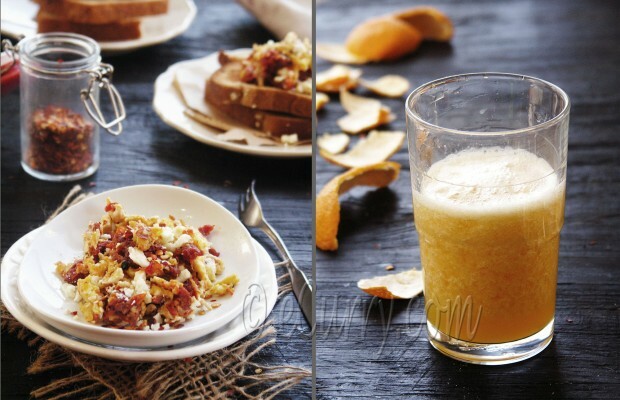 There is not a single time of day that spiced scrambled eggs will not taste good! We Indians like to spice up everything, and add onions sometimes; yes, even to the scrambled eggs to tantalize the taste buds which are used to the zest and the zing. But if you do not want them, just make it your way – without the onion or the pepper. But the sun-dried tomatoes is what makes all the difference here. I love feta, but choose your favorite cheese. Some whole grain toast and a tall glass of freshly squeezed orange juice, fiber and all. Whisk the eggs and milk until frothy and set aside. If you are not using sun-dried tomatoes in oil, you will need to re-constitute them by soaking the dried tomatoes in hot water until they are softened. Chop the tomatoes to desired size. In a skillet, heat the butter or ghee. Add the red pepper flakes; when they start to sizzle add the onions and cook at medium flame until they soften a bit, for about 2 minutes. Do not allow them to brown. Add the sun-dried tomatoes and toss it around for a minute. Slowly add the whisked eggs while breaking it gently with a fork as it coagulates. Add salt and pepper. Cook at low flame while stirring and breaking the cooked egg to form a soft scramble. Keep stirring in low to medium heat until all parts of the egg is cooked and there are no runny liquid left in the pan. The eggs should be slightly undercooked when removed from heat, since the eggs will continue to set from the heat of the pan.The onion and the tomatoes should have been incorporated into the cooked egg. Switch off the heat. Add the feta cheese to the pan, stir it in while the egg is still warm. Serve immediately. Cooking Time: 12 minutes approx. A great breakfast dish! So flavorful. A ray of sunshine in the plate. Great egg recipe- I love how eggs can be paired with so many other things and are delicious anytime of day! One of my favourite way to cook eggs! Lovely. 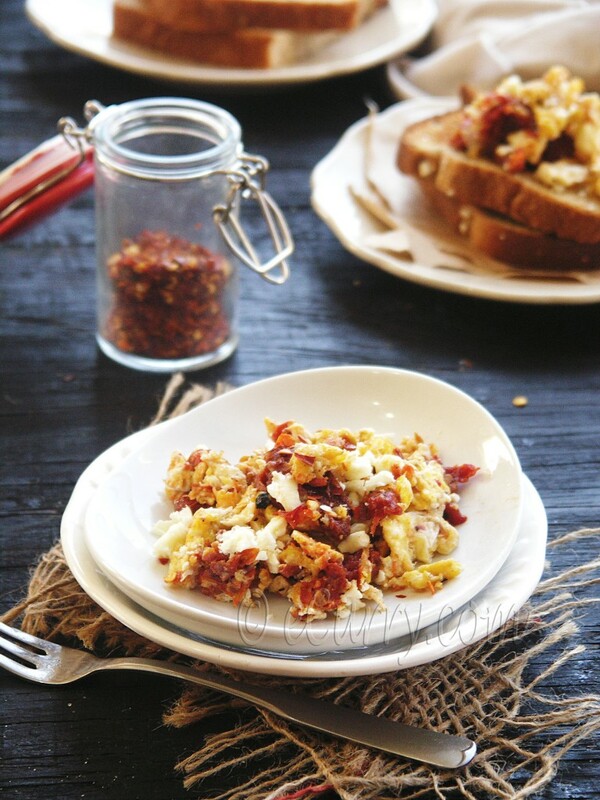 Never thought of adding sun dried tomatoes and feta cheese to scrambled eggs – what a great idea – looks wonderful! If I have rice , bread, potatoes and Eggs in the fridge….I am happy! Lovely Soma-Our family also eats eggs especially omelettes for dinner! I love mine with onion and chheese (cheddar) but have never tried it with feta and sundried tomatoes. Lovely combo! I eat eggs almost every day…they are so easy and quick! Love the addition of sundried tomatoes…thank you for sharing Soma! I also add onion in scrambled eggs sometimes. This looks delicious! Happy holidays to you and yours. This is all very terrible, too long between visits. Hope you’re well? This is just my kind of scrambled egg combination. It looks wonderful! I adore them scrambled up with fresh herbs, or made into a Spanish tortilla with plenty of potatoes and red peppers. Yum! This sounds like the type of lunch I like to make for myself too…at some point during the week I am sure to have some scrambled egg on toast! 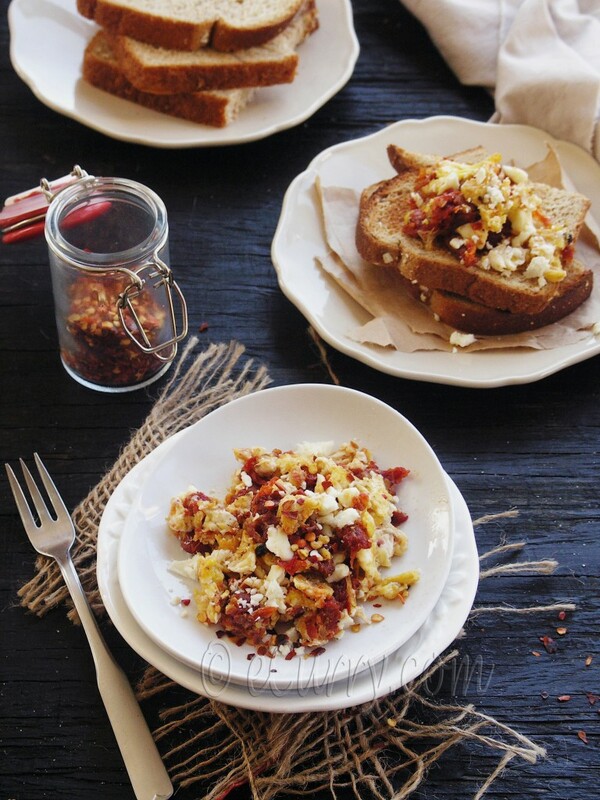 I just roasted some tomatoes and I love onions in scrambled eggs so I am sure to be trying this soon! It’s beautiful Soma! That lunch will be sort after if you make them look so pretty! 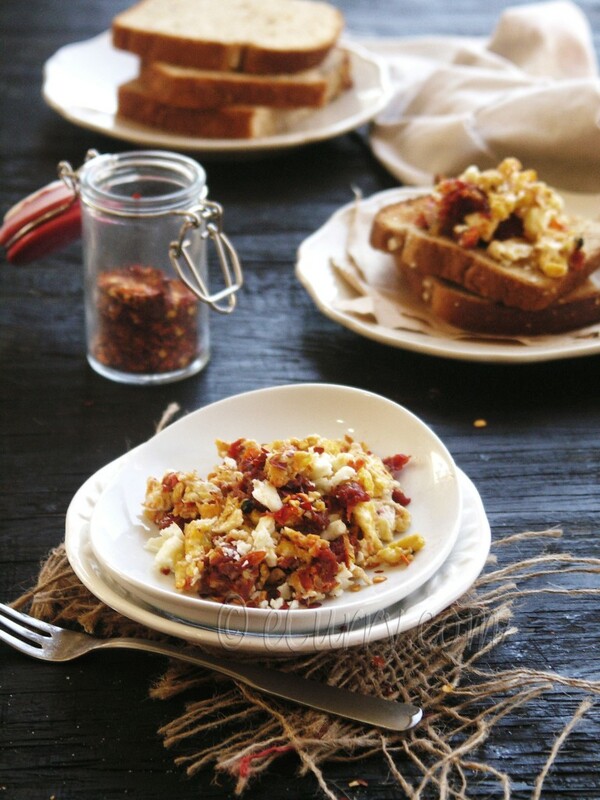 I love sun dried tomatoes and with eggs they taste even better. am sure the zing from Feta gives it a nice creamy texture. Yum Yum!